Mahoney with members of the Boston Scientific team. Mike Mahoney’s entrepreneurial spirit goes back to the summer of the fourth grade, the time he started a lawn mowing business. The enterprising kid soon learned to deal with challenges. “I borrowed my father’s mower, but then he charged for wear and tear on his machine,” Mahoney says with a laugh. 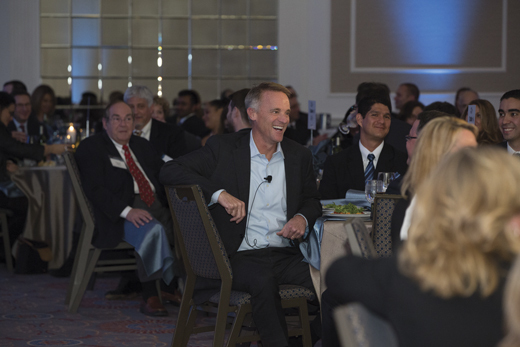 Mike Mahoney, one of Glassdoor’s Top CEOs in 2018. 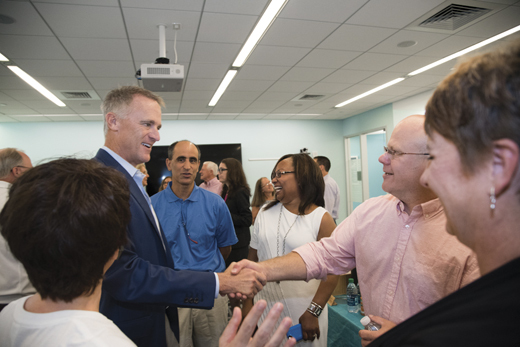 The chairman and CEO of Boston Scientific met with the Irish America team in August, when he was in New York to talk at a Morgan Stanley conference on health. Health is big business and Mahoney’s company, Boston Scientific, a manufacturer of medical devices used in interventional medical specialties, including cardiology, endoscopy, neuromodulation, urology, and pelvic health, is a lucrative investment. On first impression, you notice the full-toothed smile, bright blue eyes, slim build, and his height – over six feet. Dressed in a blazer, khakis and an open-necked shirt, he offers a strong handshake and makes you feel like you’re talking to someone you’ve known for years. Mahoney at an employee recognition dinner. As an adult working in the healthcare field, Mahoney used the constant uprooting of his boyhood to his advantage. He drew on his background of relocating, adapting to new environments, and trusting his instincts – all the childhood experiences that helped him move on to new companies and bigger positions. Mahoney greets a patient with a Boston Scientific stent and his wife, along with other members of the team. 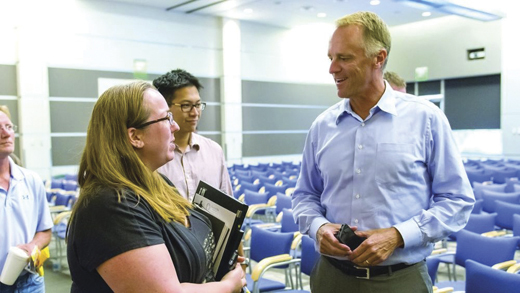 When he joined Boston Scientific in 2011 as president, it was his job to focus on the needs of the evolving healthcare landscape, make improvements to patient outcomes and increase healthcare efficiency and access. But the company was going through a rough patch. Profits were down and investors were wary. Under Mahoney’s leadership, the company regained its stride and then some. He became president, CEO, and a member of the board in 2012, and was elected chairman in 2016. 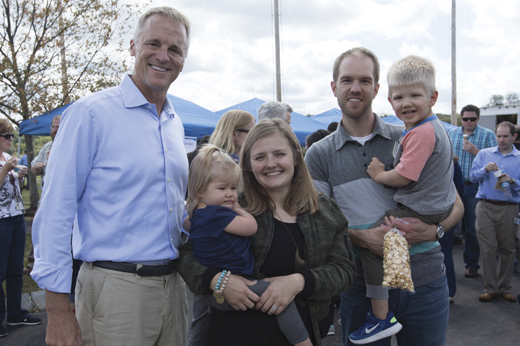 Under Mahoney’s leadership, Boston Scientific not only brought many transformational medical devices to market, it went from an underperforming company to a global medical technology leader with nearly $10 billion in annual revenue and commercial representation in more than 125 countries. What Mahoney doesn’t say about himself is that he’s a good listener. And a quick decision maker; a team motivator; a leader who empowers, challenges, applauds, and rewards. Rewards include an innovation fund to bring good ideas to life, whether they come from a junior assistant or a senior manager. That’s leadership and that’s success. Mahoney at Everyone Makes an Impact employee celebration. Today, Mahoney serves on the board of Baxter International and the American Heart Association leadership council. He earned a B.B.A. in finance from the University of Iowa and his M.B.A. from Wake Forest University. He, his wife and three children divide their time between Boston and Rhode Island. Mahoney makes trips across the Atlantic a couple of times a year to Ireland for Boston Scientific. Though many generations removed from his Irish ancestors (it was his grandparents’ grandparents on both sides who immigrated to America), Mahoney feels very close to his Irish roots. Boston Scientific has taken root in Ireland as well, with three plants located there. Working his entire life, Mahoney knows the value of commitment to the job at hand and to the many hands on the team that make it all happen. Here’s a look at the man and his values. 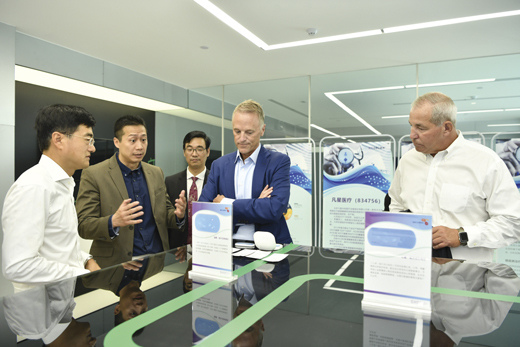 Mahoney and team at Boston Scientific Innovation Center in Beijing. I wanted to be a doctor but ran into a wall with organic chemistry. So I became a finance major. My first job out of college, I was selling NCR products door to door for 18 months. I wanted to get into health care at GE (General Electric), but they wouldn’t hire me because I wasn’t an engineer and didn’t have any healthcare experience – they wanted two years. But I kept calling on them and eventually they hired me. We used to sell CT scanners at GE. And the first time I went into an ER to see one in action, a man had been stabbed and there was an image of a man’s head with a knife sticking out. I was blown away. And ever since then I’ve been in healthcare. Maybe I’m biased, but I’ve been in lots of different companies and this one [Boston Scientific] is so fascinating. Our devices are lifesaving technology. We create deep brain stimulation for Parkinson’s patients, stimulators to help people with severe pain, stents that unblock your heart when you have a heart attack, and defibrillators that prevent sudden cardiac death. The products we make are life-changing – and incredibly cool. So when you look at other industries, and this is where I’m biased, nothing compares to that impact on patients’ lives. I left GE to run a startup IT healthcare company in Boulder, Colorado, which was fun, and I did that for six years. I probably learned more on the job with this IT startup because I had to do everything, including make payroll. After that I took the job at J&J, where I spent six years, first with the orthopedics business and eventually running their medical devices division. That was another learning curve. 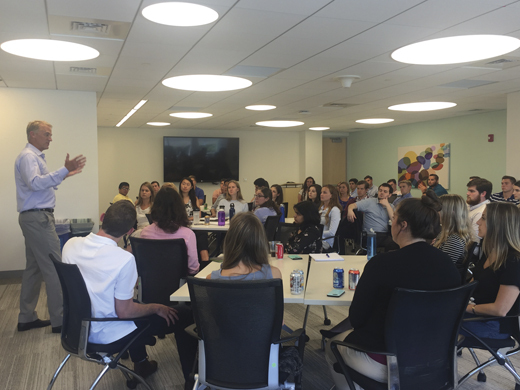 Mahoney addressing a group of Boston Scientific summer interns. Boston Scientific had a ton of debt when I came on board in 2012. The company was not growing and reported a five percent decline in sales in 2012. In 2017 we achieved eight percent revenue growth and consistently outperformed analyst expectations across all business segments. Today, market capitalization is $50 billion. 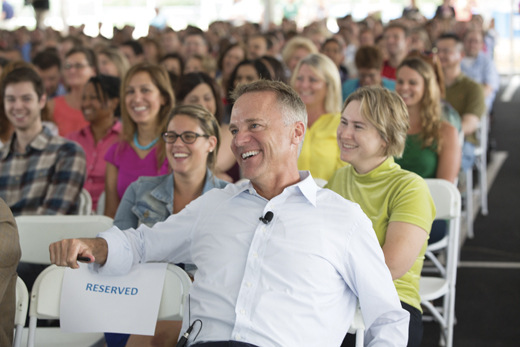 When I first joined Boston Scientific, we spent a lot of time creating a new vision for the company that would be exciting for employees. Many of the same leaders were still there, but we also brought in some new leaders. We really looked at it the way you might look at a startup. We created a new culture, a new pace, and a winning spirit. We are much more nimble and agile today. We have also created an environment where employees feel more encouraged to challenge the status quo and risk failure without fear of being reprimanded. Each quarter, we give “Winning Spirit” awards to teams that go above and beyond in tackling tough issues and delivering results. I’d say there are two critical elements of culture that apply to most organizations. First, having a great leadership team in place around you, and empowering them to make good decisions and move quickly. We have leaders that have been with the company for some time, and we also have brought in new leaders to help evolve the culture. Second, but just as important, is having a common mission and set of core values that engage employees and help them feel proud of the work they do. We established our purpose of “Advancing Science of Life” and developed core values like meaningful innovation, caring and collaboration, ­­­­diversity and high performance – all of which are anchored in a Winning Spirit mindset. We look for authentic leaders who are driven to take on new challenges and demonstrate the ability to be agile, to anticipate and adapt to change and take on appropriate risks. This requires a high-performance mindset, but also a certain humility that drives curiosity and an openness to new ideas from diverse people, experiences, and perspectives. It’s also important to have a sense of humor. Sometimes the best way to deal with life’s challenges is to simply laugh at yourself. Mahoney with team for the opening of the Penang Malaysia facility. In our world there is so much miniaturization of devices. We are working on a pacemaker that is the size of a thimble and it is leadless – there’s nothing that goes in the heart. You’re seeing miniaturization of devices to manage pain in Parkinson’s and stroke patients. There are all kinds of digital applications, patient interfaces, and artificial intelligence. It’s ingrained within the products that we make and how we communicate with patients and doctors. A lot of the research we’re doing is being done in Ireland. We started with one facility in 1994 and today we have plants in Galway, Cork, and Tipperary. We’re among the largest medtech employers in Ireland now. We have great engineering there. We hire a lot of Irish engineers and interns – there are very good engineering schools in Ireland. Now the medical technology industry in Ireland is evolving from being prominently manufacturing focused to one that is more complex and driven by R&D, with great examples of collaboration between research institutions, clinicians, manufacturing companies and government agencies. I love going over there. I wasn’t born in Ireland, but my family has a history there. Boston Scientific has also had a strong connection for nearly 25 years, and we’ve grown over time thanks to the success of our Irish teams – highly skilled, extremely hardworking and very loyal. Mahoney with patient Emily Herman and her family. My father’s family is from Cork and my mother’s family, the McCarthys, are from Mayo. My grandfather Earl Mahoney, my dad’s father, had the most influence on me. He was a pediatric cardiac surgeon in Rochester, New York, and would have to crack open chests. Today we have a tiny aortic valve of manmade materials that can be inserted. He would have thought this was something out of Star Wars. I used to go to his home when I was about 10 and sit in the leather chairs in the den amidst the leather books on the shelves. He had these wonderful pipes. And while he was with patients in his office I would puff on a pipe and pretend I was a doctor like him. Find the industry you have the most passion for – that’s the most important one. I’m very fortunate that I am in healthcare and medical technology. I just love it. You’ve got to love what you do and the area you’re in. You’re going to put the extra time in and care about it beyond the financial piece. That’s what I tell my kids. I don’t care whether it’s healthcare or teaching, or something else. If you love it, you’ll have the chance to really shine.